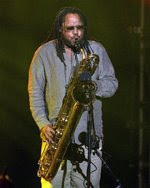 LOS ANGELES (AP) -- LeRoi Moore, the versatile saxophonist whose signature staccato fused jazz and funk overtones onto the eclectic sound of the Dave Matthews Band, died Tuesday of complications from injuries he suffered in an all-terrain vehicle accident, the band said. He was 46. Moore died at Hollywood Presbyterian Medical Center, where he was admitted with complications that arose weeks after the June 30 wreck, according to a statement on the band's Web site. It did not specify what led to his death, and nursing supervisor Galina Shinder said the hospital could not release details. On June 30, Moore crashed his ATV on his farm outside Charlottesville, Va., but was discharged and returned to his Los Angeles home to begin physical therapy. Complications forced him back to the hospital on July 17, the band said. The band went on with its show Tuesday night at the Staples Center in Los Angeles, where lead singer Dave Matthews acknowledged Moore's death to the crowd after the first song. "It's always easier to leave than be left," Matthews told the crowd, according to Ambrosia Healy, the band's publicist. "We appreciate you all being here." Link. Thanks to Erin for sending it along.